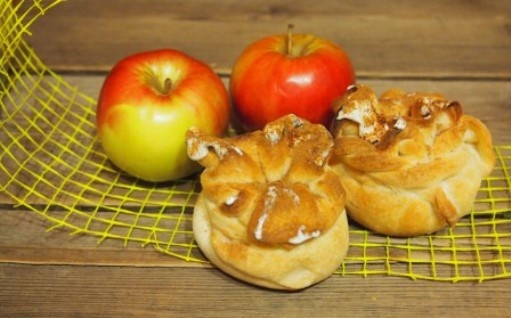 Apples, cinnamon and raspberry was found in one recipe. And sang a song that I want to listen to again and again. Rather, I want to eat them again and again. A win-win for your family Breakfast, picnic, snack, meeting friends, coming to visit his mother. The reason are endless. Prepared quickly, eaten up very quickly. Those who are on a diet, it is recommended that early in the morning to maintain a good mood and avoid breakdown eat one bun. 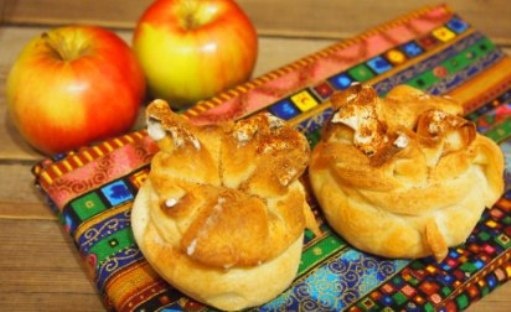 To prepare delicious muffins with apples, raspberries and cinnamon more fun in the company. If you don't believe - try. Thaw the dough, divide it into eight parts. Roll out thin squares. Leave for some time. To prepare the filling. Clean the apples from the skin. Cut into small cubes. In a deep frying pan heat the oil. Arrange the apples and fry a little. Add the raspberries, mix well, cover and then for five minutes. Add brown sugar, stir and wait to dissolve. To wait until it has cooled. Spread the filling on the dough, raise the edges and pin. Turn on the oven, put the buns on a baking sheet and leave the oven door open. In thirty minutes, when the buns will fit, close the oven and bake at 200 degrees. When the buns browned - remove from the oven. After muffins with apples, raspberries cooled, spread the top with sour cream and sprinkle with cinnamon. To prepare muffins with apples, raspberries and cinnamon, do not have to use the filling in this part. You can replace raspberries black currants or strawberries, and apples - pears. Importantly, the fruit was fresh or frozen. So the filling is so delicious and flavorful, and the amount of sugar can be adjusted.